He died on 9 Jan 1991 in VA Medical Center, East Orange, New Jersey. Frederick C. Walter, 383 Main Road, Hanover Township, died January 9, 1991, in the VA Medical Center, East Orange, NJ. He was born in Wilkes-Barre, son of the late Frank and Gertrude Kreig Walter. He attended Wilkes-Barre schools and served with the Army M.P.s during the Korean Conflict. He was employed for several years as a letter carrier by the U.S. Postal Service. (He also was a cafe owner.) Mr. Walter was owner and operator of Fred's Buttonwood Inn, Hanover Township. 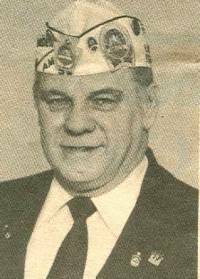 He was past commander of American Veterans Post 59, Hanover Township and past commander of National District II American Veterans. He was a member of American Legion Post 609 and St. Conrads Young Men's Society. Surviving are sons, Frederick C. Walter, Georgia; Ken F. Walter, Wilkes-Barre; daughters, Doreen and Heidi Walter, both of Wilkes-Barre; Wanda Benjamin, Oklahoma; brothers, Francis, Toms River, NJ; John, Liverpool, NY; sisters, Ruth Walter, Wilkes-Barre; Mrs. Edward (Dolly) Baranousky and Mrs. Michael (Claire) Krafjack, both of Falls; and nine grandchildren. Funeral will be held Saturday (January 12, 1991) at 8:30 from the Walter W. Lisman & Son Funeral Home, 233 S. Washington St., Wilkes-Barre, with Funeral Mass at 9:00 in St. Nicholas Church, Wilkes-Barre. Interment will be in Indiantown Gap National Cemetery, Annville.